To change a bit of usual here is a new Modern&SciFi plan. 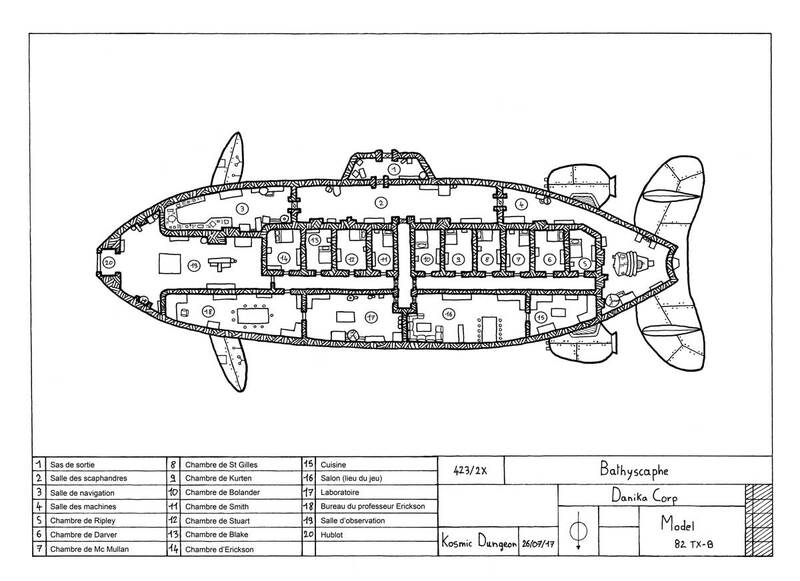 I drew this submarine for a friend who is organizing for us a Murder party on the Chtulhu theme. We’re playing November 11th and I’m really looking forward! Lady Wenfick became famous through various travels to inhospitable regions to prove to the world the existence of legendary creatures. This naturalist graduated from the sciences faculty of Paris was responsible for the excellent pictures of the Bigfoot, the Loch Ness monster, and many others. Her latest research led her to settle in Florida in the early 1920s. She tracked the Polypous Giganteus for Five long years and now, she is convinced that the giant octopus hides himself in the bottom of the Puerto Rico Trench. Lady Wenfick secretly prepared a costly reconnaissance mission, she is determined to undertake a perilous scuba dive to explore this gigantic Oceanic trench. A group of renowned researcher and scientists were selected to participate in the expedition. Lady Wenfick unveiled for the occasion the latest creation of her chief engineer Dennis Richardson, the bathyscaphe: a strange submarine looking like an imposing cetacean. While some passengers were scanning the control screens of the various measuring and navigation devices, others were excitedly contemplating the abysmal darkness through the enormous porthole. While the exaltation of this probable scientific discovery reached its climax, the submersible was touched by a severe shock wave. Immediately after the jolt, a shrill alarm rang out. The Lady Wenfick’s assistant’s nasal little voice crackled in the speakers and invited all occupants to gather in the main salon. After a few moments of panic, the young man entered, confusion was read on his pallid face. A terrible accident occurred abruptly while Dennis Richardson and Lady Wenfick were conducting a security inspection. The engineer wanted to check the strength of the rivets as well as the resistance of the hull before continuing the descent and to subject the bathyscaphe to higher pressure. The young man explained that he had heard frightening cries coming from the diving suits’ communication system just before he felt the shock wave. After several unsuccessful attempts to etablish contact with his companions, he brought them back to the submarine using the safety cables, but what was his surprise when he noticed that Dennis Richardson was dead and Lady Wenfick was terrified. They all rushed into the diving suits room and saw that the young assistant was telling the truth. Apparently the engineer had been cut in two pieces, the remains of his body lay in a blood pool. One could clearly see that his flesh had been torn apart by the violence of the attack, his shredded entrails spread over the ground and emitted a nauseating odor. Lady Wenfick was staying prostrated on herself in a corner of the room, her words were incoherent, and she even stammering incomprehensible sentences pieces in an unknown language. Was it the monster who attacked them? What could have put Lady Wenfick in a such state of shock? The only reassuring information in this situation is undoubtedly the slight vibration which indicates that the submarine is still in motion, but for how long? It’s obvious that the thing responsible for this attack will come back and start again. What will the PCs decide to do. Perhaps this is the only solution to get out alive.